For those in favor of bringing Pete Mackanin back for 2008, today's game seems to be the prosecution's exhibit A when making the case against it. It's the end of a long season and Aaron Harang has been nothing short of brilliant for the Reds in 2007. If there is a more important player for the Reds chances in 2008, I don't know who it would be. That said, seeing Pete Mackanin leave Harang out there in his final start to throw 125 pitches was mind boggling. Given the Reds overflowing bullpen and their need to get a look at some of the young relievers so they can properly evaluate them, it's hard to find any support for making Harang work so hard. It would be one thing if the game had playoff implications, but the Cubs have already clinched the NL Central, so there is no reason why Harang should have been worked so hard. Despite Mackanin's poor handling of the situation, it's hard not to be amazed by Harang. Of his 125 pitches, Harang threw 95 strikes. A remarkable game from the undisputed ace of the staff, but it would be nice to have him healthy and productive in 2008. The Reds ran out of steam over the final couple of weeks, which may be a good thing for the Reds. They have gone 9-17 in September and lost their last 7 in a row. This collapse is proof positive that the Reds improved play had less to do with the hiring of Mackanin than it did the firing of Narron. Sometimes change is just good for change's sake. Hopefully, the Reds will bring in a highly qualified and competent manager for 2008 and show Mackanin the door. Mackanin doesn't deserve to be considered for the 2008 managerial job, but rather just deserves thanks for keeping the ship off the rocks over the second half of the season. Yes, it looks like for essentially the first time since the advent of the Wild Card, Major League Baseball has an actual pennant race on its hands. The New York Mets have been in free fall for the past several weeks, while the Phillies are streaking towards the postseason. These two teams are tied, heading into the final game of the season. What makes this season different from years past is that the team that does not win the NL East may not make it to the playoffs at all. As it stands now, the Mets and Phillies are tied atop the NL East with records of 88-73. However, San Diego sits atop the Wild Card race with a record of 89-72. The Mets and Phillies are tied with Colorado in 2nd place in the Wild Card race. In recent years, any potential pennant race has been short circuited by the fact that the loser of that race invariably ended up with the Wild Card. That takes all the suspense, import, and drama out of the chase. That's one of the main drawbacks of the Wild Card system and it's nice to see that that isn't actually the case this season. Tomorrow should be fun, so take the time to enjoy an event from seasons gone by.... a pennant race. Or, at least shortstop in 2008. At this point, Keppinger is making a strong case to be the fulltime shortstop for the Reds next season. His offense has been robust and his defense surprisingly stellar. The presence of Norris Hopper and Jeff Keppinger at the top of the lineup has created a different dynamic to the offense. Both are tremendous contact hitters and have such high batting averages that they seem to consistently be on base. I previously discussed Hopper and came to the conclusion that he was better suited for a backup role in 2008. However, in looking at Keppinger, I come up with the opposite result. He seems to be the best option to be the starting shortstop in 2008. One of the more interesting aspects of Keppinger season is that he has primarily done his damage on the road. His home numbers are solid, but he really shines on the road, which is counterintuitive when you consider the park effects of Great American Ballpark. One redflag is that Keppinger has an abnormally high Batting Average on Balls in Play (BABIP), so he has received more than his fair share of "hit luck." He should see some regression to the mean in 2008, but he could still be a solid .300 hitter who rarely strikes out, as evidenced by his career contact rate of 92%. As for defense, Jeff Keppinger has been surprisingly effective. Personally, as a general rule, I don't believe in moving players from less challenging defensive positions to more difficult ones. That is generally an unwise move, but in this case it may be working out just fine. Defensive metrics are typically flawed in some way. However, if all the metrics point to the same end result, then there is likely something to it. If you compare what Keppinger has done at shortstop to Alex Gonzalez's performance, Keppinger has been better across the board. He has gotten to more balls and made fewer errors when he gets to them. There is a question of sample size, but so far Keppinger appears to at least be Alex Gonzalez's equal with the leather, if not his superior. It appears that the Reds could save money, establish a more well diversified offense, and possibly improve the defense by trading Alex Gonzalez away and installing Jeff Keppinger at shortstop full time in 2008. Keppinger would certainly be an effective #2 hitter in the order and could be the table setter the Reds have lacked in recent years. Norris Hopper has been one of the hottest hitters in baseball in the second half. In fact, since the All-Star break, Hopper is hitting .387, which is tops in the NL. That kind of hot streak has led to a lot of speculation about Hopper hitting leadoff for the Reds in 2008. Unfortunately, I think that would be more than a little unwise. Hopper is not a disciplined hitter, which is typically what you want to see out of your leadoff hitter. An ideal leadoff hitter should get on base at a good clip, see a lot of pitches, and grind out every at bat in an attempt to get on base any way possible. Hopper is an aggressive hitter who consistently forces an early conclusion to an At Bat. That kind of approach really limits the number of pitches you see and walks you get. That kind of approach results in an On Base Percentage that is made up largely of Batting Average. It is difficult to be an effective leadoff hitter if that is the approach you employ. It can be done, but the best leadoff hitters reach base in other ways besides a hit. If you compare Hopper to four of the best leadoff hitters throughout history, then you'll see a vastly different approach utilized by Hopper than the others. Those four are some of the best leadoff hitters in baseball history, though they utilize different approaches. Here's a bit about the similarities and differences in style. It's hard to argue against Rickey Henderson being the best leadoff hitter in baseball history. His walk rate is very high (16.4%), sees a ton of pitches (4.34), rarely swings at the first pitch (13%), and makes contact with great frequency (88%). Henderson is the archetypal leadoff hitter. Tim Raines was a similar leadoff hitter to Henderson, but a bit more aggressive. Rock Raines saw fewer pitches (3.76), walked at lower clip (12.8%), swung at the first pitch with greater frequency (25%), and made contact slightly more often (89%). Still, Rock and Rickey were too patient leadoff hitters who were massively successful. Craig Biggio was a successful leadoff hitter, though he utilized a slightly different approach. Biggio had good speed and baserunning instincts, but had much more power than the usual leadoff hitter. In addition, Biggio had a lower walk rate (9.3%) than Rickey and Rock, but he made up for some of it by using the HBP as an offensive weapon. Over his career, 2.3% of Biggio's Plate Appearances ended in a hit by pitch. That's a much higher percentage than the others listed and helped increase Biggio's OBP. At the other end of the spectrum is Ichiro, whose approach at the plate is mirrored by Norris Hopper. Ichiro has tremendous bat control and walks very infrequently (6.4%). He relies on hits, rather than walks and hit by pitches to get on base. Ichiro's OBP is only .046 higher than his batting average over his career. That said, he needs to hit around .315 to even have an OBP above .360. You don't want your leadoff hitter to have an OBP much lower than .360. As for Norris Hopper, the first thing that jumps out at me is the percentage of pitches at which Norris swings (41%). It is almost to the point where Hopper swings at every other first pitch that he sees. It seems difficult to fathom that when this information gets around the league that Hopper will be able to maintain his level of production. If pitchers see that you'll offer at the first pitch so often, then they will refuse to give you a 1st pitch to hit in an At Bat. Once word gets around the league on Norris Hopper, he'll need to make serious adjustments in order to maintain his success. Similar to Ichiro, Hopper would need to hit for a very high batting average in order to have an OBP high enough to justify batting leadoff. Hopper's IsoOBP is even lower than Ichiro's at .040, so he'd have to hit .320 in order to even post a .360 OBP. As it stands now, even if Hopper hit .300, he would still fail to have an OBP high enough to be an effective leadoff hitter. In addition, Hopper steals bases at a much lower clip than the others. Over his career, Hopper is only at a 65% success rate, which is poor for someone with his speed. In fact, from a statistical standpoint, a success rate of 65% actually does more harm than good to the offense. If you aren't any more successful than that, then you are better off not attempting to steal at all. Personally, I don't think it is common for a hitter to adopt a substantially more disciplined approach at the plate. It happens from time to time, but that is more of the exception to the rule, then the rule itself. For the most part, a hitter is who he is at the plate. So, it would be unwise to pencil Norris Hopper into the leadoff spot in 2008 with the expectation that he'll either hit .320 or suddenly increase his walk rate. Neither seems very likely, so the Reds would be wise to utilize Norris as a 4th outfielder. **Norris Hopper dropped down a bunt on the first pitch of the game and beat it out for a single. By the time he got back to first base, home plate umpire Bob Davidson had called him out for being out of the batters box when contact was made. Replays clearly show that Hopper was inside the box and Davidson blew the call. To top it all off, Davidson then proceeded to eject Hopper, who was riding Davidson from the dugout. Davidson, who is deridingly known as Balkin' Bob for his overzealous balk calls, clearly compounded the problem by throwing Hopper out of the game. MLB umpires are the best in all the major sports, but Davidson's performance tonight was an embarrassment. **Mackanin really handled the Hopper situation poorly, as he should have been out of the dugout arguing the call. If he had gone out to argue the call, then Hopper likely wouldn't have been thrown out of the game. Poorly handled by both Balkin' Bob and Mackanin. **The Reds first three hitters of the game put the first pitch they saw into play. Hopper should have been safe at first on the bunt and Keppinger and Phillips both hit the ball hard, but I'd like to see a bit more patience at the plate. There's really no reason why Hopper had to drop the bunt down on the first pitch. One of the jobs of the leadoff hitter is to take pitches to let the players behind you see what the pitcher is throwing. Hopper needs to demonstrate a greater understanding of what it takes to be an effective leadoff man before he can lay claim to a larger role for the Reds. Hopper needs to realize that singles hitters who can't set the table are not worthy of substantive roles at the MLB level. **Jeff Keppinger made a real nice play at shortstop on a slow roller by Bengie Molina. Obviously, Kepp had a lot of time given the glacial pace at which Molina moves down the line, but Kepp charged hard, had good footwork, made a smooth transition with the ball from glove to hand, and made a strong throw on the run. Those are the kind of plays that give you confidence that maybe Keppinger can handle short over the long haul. **Jorge Cantu put a few nice swings on the ball and racked up three doubles. As of right now, he looks like another steal for GM Wayne Krivsky. 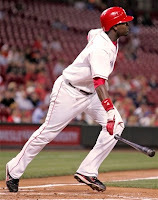 Cantu isn't likely to be a starter, but he gives the Reds a nice bat off the bench and greater flexibility on defense. Given that the Reds gave up almost nothing to get him (Cantu, Shaun Cumberland, and cash for Brian Shackelford, Calvin Medlock, and future considerations) he's another good risk/reward move by Krivsky. **Buck Coats is intriguing. He may not be a starter, but he looks like he could be a solid 4th or 5th outfielder. He plays good defense, has good speed, and seems to hit a little bit. Could be a nice depth acquisition by Krivsky. **Kevin Frandsen is really hitting the ball well as of late. He's locked in and hitting line drives from gap to gap. He's got good pitch recognition and tremendous bat control. He's going to be a pretty good player. The Giants think he's another Robby Thompson with more offensive upside, which isn't half bad. **It's hard to believe how much good young pitching the Giants have acquired. Tim Lincecum, Matt Cain, Jonathan Sanchez, Kevin Correia, Noah Lowry, and even Pat Misch look like potential impact starting pitchers at the MLB level. It's really an embarrassment of riches. **It'll be very interesting to see how the Reds handle Norris Hopper and Jeff Keppinger. For the past few years, critics have been saying that the Reds rely too heavily on the long ball and need a more diversified offense. Critics point to the strikeout totals of the team as being a big problem. While I don't necessarily agree, as I think the detrimental impact of strikeouts is overrated, it's clear that Keppinger and Hopper are the type of contact hitters for whom the public has been clamoring. For his career, Jeff Keppinger has made contact on 94% of his swings, while Hopper is at 88% for his career. Just for comparison sake, Ichiro is at 89% for his career. Keppinger and Hopper rarely swing and miss, but also don't walk or tally many extra base hits. So, would they help diversify the offense or act as a drag on the team's production? **Interesting to see Joey Votto play. 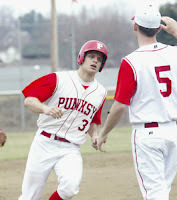 In the day of the hulking slugger, it's interesting to see a good hitting firstbase prospect who isn't muscle bound. **Poor job by Jason Ellison on the ball hit by Omar Vizquel in the 6th inning. Coats made a sliding effort, but Ellison wasn't in position to back him up. Obviously neither Coats or Ellison is a starter in 2008, but that play is just emblematic of the Reds need to improve the defense for 2008. They won't improve until the team defense is better. In 2006, the Reds DER was .684. In 2007, the team DER has actually fallen to .680. So, despite moving Griffey out of center and bringing in Alex Gonzalez, the Reds are turning "balls in play" into outs at a lower clip. The Reds MUST improve the defense or they will NEVER become a viable playoff team. **It's time to close the book on Matt Belisle. He's just not an effective starting pitcher. **Phillips seems to be pressing to get his 30th homer. If he does get one more homer, then he'll join Barry Larkin, Alex Rodriguez, and Alfonso Soriano as the only middle infielders in MLB history to have 30 homers and 30 steals in a season. **Mike Stanton may well be done. He gave up a three run homer to Omar Vizquel in Pac Bell Park. That's not easy to do. How hard is it? Prior to his homer off Stanton, Omar had 2 homers on the season and only 1 in Pac Bell Park and had not hit a righthanded homerun since June of 2005. One of the biggest stories of the offseason for the Reds was the news that Adam Dunn had spent the offseason working out and was reporting to camp in the best shape of his career. 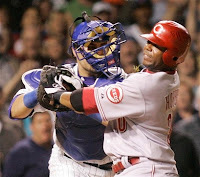 This was welcome news to the Reds nation, as Dunn was coming off an appalling finish to the 2006 season. While Dunn receives much unwarranted criticism, it's hard to argue that he consistently fades away late in the season. Dunn's numbers have suffered over recent years, not because his peak level of production had fallen off, but rather because Dunn has been unable to sustain that peak level in the hot summer months. Dunn's August and September production has consistently fallen off and dragged down his seasonal averages to much lower levels. Dunn didn't really need to take his offensive performance to a new level, but rather become more successful at maintaining that level over the entire season. It appears that Dunn's offseason conditioning program may be paying off in a big, big way, as his 2nd half performance in 2007 has actually been better than his first half production. Being in better shape seems to have enabled Dunn to avoid the late season fatigue that has characterized his previous seasons. Accordingly, 2007 may be his finest ever, which is due in no small part to Dunn performing better in the 2nd half than he did in the 1st. The moral of the story seems to be, sometimes, hardwork pays off. Well, our All Undervalued Team is coming together nicely, but it's time to identify our closer. The guy who can slam the door and ensure victory. There are a number of interesting candidates around the majors, including a couple (Bray and Burton) on the Reds, but Brian Wilson of the Giants gets the nod. The Giants drafted Wilson in the 24th round in 2003 out of Louisiana State University. Wilson was primarily a starter at LSU, but has worked almost exclusively as a reliever in his professional career. Wilson had his development hampered by an elbow injury, which required Tommy John surgery, but has begun to emerge as a potential dominant closer. Wilson has three factors weighing heavily in his favor as a potential closer. Those three factors are: 1) He possesses tremendous stuff, 2) appears to have the appropriate mindset and mental toughness for success, and 3) the Giants WANT him to be the closer. As to the first factor, Wilson throws a very heavy ball. He's got great velocity and a nasty slider, which undoubtedly has the Giants dreaming of another becoming the new Robb Nen. Wilson also has the desire to close. He wants to be the guy on the hill with the game on the line. A lot of young pitchers shy away from that kind of responsiblity, but Wilson doesn't appear to be one of them. Mental toughness is as important to consistent 9th inning success as is great stuff. Wilson appears to have both. Finally, the Giants seem to want Wilson to claim the job. It is a lot easier to maintain an organization's faith in you, than it is to create that faith. Given the Giants desire to see Wilson succeed in the closer role, he'll have the opportunity to do so and the backing of the organization through any growing pains. Like most pitchers, the three most important elements of a successful closer are limiting walks, racking up strikeouts, and getting groundballs. Wilson has done a nice job of getting groundballs and missing bats, but like most power pitchers has struggled at times with his control. As his control improves, his walk rate will decrease and his strikeout rate will increase. Effective closers need to limit the number of free passes they allow, as the margin for error for a closer is often razor thin. A closer's best pitch is often times strike one. In 2007, Wilson has thrown a first pitch strike 69% of the time. For comparison, on his career, Mariano Rivera has thrown a first pitch strike 61% of the time and Trevor Hoffman is at 64%. If Wilson can consistently locate his fastball and control his wicked slider, then he'll be a very effective late inning reliever. "The Giants drafted Wilson in the 24th round in 2003, knowing he wouldn't be able to pitch for a year because he had to recover from Tommy John surgery. Wilson's first pro season was a disaster, and he admitted he sometimes skated through his rehab work before rededicating himself and dominating the last two years. Wilson's biting 90-mph slider is the best in the system and is reminiscent of Robb Nen's signature pitch. He throws in the mid-to upper 90s with his fastball and hit 98 mph in the big leagues. Quietly intense and armed with a huge water serpent tattooed on his left arm, Wilson has the look of a closer. Fastball command was an issue for Wilson in San Francisco, and it maybe partially explained by an oblique strain that kept him from getting into a consistent rhythm. He feeds off adrenaline, which can work against him when he overthrows or tries for the strikeout. He hasn't learned to handle poor outings yet. 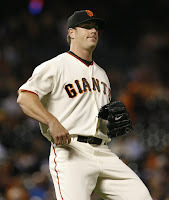 The Giants prefer an established presence in the ninth inning, so Wilson may have to settle for a setup role this year. If he succeeds there, he could close for San Francisco in 2008." The Giants have already given Brian Wilson several save chances in 2007 and he successful converted all three. In addition, he's been an effective setup man, as evidenced by his 8 holds. Given his pure stuff, his closer mentality, and groundball tendencies, I'd love to have Wilson in the Reds bullpen, which for a large part of the season seemed to lack mental toughness. All in all, it appears that Wilson has all the makings of an effective closer and an organization with an interest in making it happen. In fact, it could happen as soon as 2008. He's certainly one to watch and he's unlikely to fly below the radar for long. What Josh Hamilton has accomplished this season is truly, truly astonishing. Given that he used his new found faith to concur his demons, Hamilton might paint his unlikely coming as a miracle. Maybe it is, but it seems to be more of a testament to his massive talent and unrelenting determination to overcome his drug addiction. Just to provide a bit of perspective, it's worth the time to recap Hamilton's saga. Hamilton attended Athens Drive High School in Raleigh, North Carolina. He played outfield and pitched on the high school baseball team, where scouts consistently clocked his fastball at 95 mph. In 2001, Hamilton was involved in a car accident, which cut short his season. In 2002, Hamilton was unable to play due to lingering back and shoulder injuries and began using recreational drugs during his time away from the team. On July 15, 2002, Hamilton was suspended for violating MLB's substance abuse policy. He wouldn't be reinstated by MLB until June1, 2006. Between July 15, 2002 and June 1, 2006, Hamilton admitted to being in drug rehab 8 different times and attempted suicide 3 different times. On October 6, 2005, Hamilton finally stopped using drugs. Hamilton was selected in the 2006 MLB Rule V draft by the Cubs, who then immediately traded him to the Reds to complete a prearranged trade. Hamilton has been nothing short of amazing for the Reds, despite his years largely away from baseball and never ending battle to maintain his sobriety. 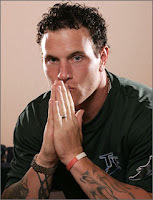 Here is a great article by Joe Posnanski, one of the best baseball writers in the country, about Josh Hamilton. And, here's an ESPN the Magazine article written by Hamilton about his struggles and redemption. Those numbers are impressive enough on their own, but if you project that level of production out over a full season of playing time, then it really comes into focus just how good his season has been. If the Hamilton can stay healthy in 2008, which is questionable given the abuse he has done to his body, then the Reds have an MVP caliber player on their hands. The Reds basically acquired an MVP caliber talent for nothing, which ranks as one of Krivsky's (or anyone else's, for that matter) best acquisitions. In the near future, Hamilton and uber-prospect Jay Bruce, who was recently named the Minor League Player of the Year for 2007, should form a dynamic outfield duo for years to come. It may seem odd to have one of the least productive offensive players on a list of undervalued players, but that's a testament to just how good Adam Everett has been with the leather. Unfortunately, Everett's defense is still tremendously underrated, perhaps because he doesn't do back flips while running onto the field or needlessly field choppers with his bare hand. That said, self-promotion is the only thing keeping Everett from his rightful place among the pantheon of the greatest defensive shortstops in history. Everett was originally drafted by the Boston Red Sox with the 12th overall pick in the 1998 draft. Everett was drafted out of the University of South Carolina, where he excelled at the shortstop position. Everett spent two years in the Red Sox organization, where his impressive defensive abilities were constantly on display, but concerns about his bat led the Red Sox to trade him to the Houston Astros along with Greg Miller for Carl Everett. Everett spent several years in the Houston minor league system, where the Astros attempted to improve his offense to the point where he would be a viable, everyday shortstop at the MLB level. Taking a break from minor league baseball, Adam also joined the United States Olympic team at the 2000 Olympics in Sydney. That team, which included Ben Sheets, teammate Roy Oswalt, and Doug Mientkiewicz pulled off an upset of the high powered Cuban team to win the Gold Medal. In 2002, at the age of 25, Everett laid claim to the Astro shortstop job and hasn't relinquished it since. Adam Everett is the rare player that looks as good on defense in traditional scouting as he does in statistical analysis. All it takes to see why Everett is such a top flight defensive player is to see the way he carries himself at short. Everett has a strong arm and good agility. His footwork at shortstop is impeccable, as he sets his feet very quickly, which consistently puts him in a good position to throw. Everett's range and skills are so good that he makes the difficult plays seem routine, which may actually hurt him in the reputation department, as people may not appreciate how good he actually he is. Admittedly, Adam Everett is a poor offensive player, there just isn't a polite way to put it. His career line of .247/.299/.357/.656 makes him one of the worst offensive regulars in baseball, so there just isn't much point in dwelling on it. However, the fact that a team carries a player with that level of offensive production is a testament to his defense. The only positives that Everett brings to the table on offense are his bunting ability and his baserunning. Everett is one of the better bunters in baseball and is very effective at advancing runners. Also, Everett is capable on the basepaths, as evidenced by his 77% stolen base success rate. Unfortunately, when it comes to actually hitting the ball, Everett doesn't excel. Defensive statistics are not perfect. Each one has a flaw or two that prevents you from getting directly to a quantifiable value for a player's defensive value. That said, if you take all the defensive statistics together and they all point to roughly the same conclusion, then it's a good bet that it's true. That definitely rings true with Adam Everett, who is quite simply the best defensive shortstop in baseball. In fact, he's the best defensive player in baseball. Period. If you look at his statistics from 2006, almost across the board Everett is the top player in each category. He has fantastic range, as evidenced by his Zone Rating, Revised Zone Rating, +/- performance, and the balls he has fielded that are out of his zone. In addition, his fielding percentage is fantastic, so not only does he get to more balls than all other shortstops, but he makes fewer errors on those balls. To top it all off, you have his performance on turning double plays, where he turned the most double plays among shortstops in 2006. He didn't fare as well on starting double plays, but that speaks more to the ability of Craig Biggio to turn the double play than it does to Everett's ability to start it. The more difficult question is just how much is Everett's defense worth to his team. In John Dewan's Fielding Bible, they discuss how to use the +/- rating to roughly determine the impact the player's defense has on the team. The book states that a "little less than half" of a player's plus/minus rating is a good estimate of the number of runs prevented. So, in 2006, Everett's +43 rating prevented about 20 runs. Another rule of thumb is that a good estimate of the value of a win at 10 runs. So, in 2006, Everett's defense prevented about 20 runs, which generated an extra 2 wins for the Astros. One player accounting for ~2 wins with his defense alone is remarkable and unparalleled in the game today. That's the kind of impact that Everett can have on a team and that's the reason he is still undervalued. You won't find a player in the game who has more impact on a team's performance with his defense. Today, the Reds finally made their September call-ups, ending the suspense. The Reds tapped Todd Coffey, Kirk Saarloos, Brad Salmon, Joey Votto, newly acquired Buck Coats, and Ryan Hanigan. Unfortunately, it didn't take Todd Coffey long to go back to his early season ways, as he gave up 3 hits, 3 runs, a walk, and a home run without retiring a single hitter. If anyone knows how someone with his stuff gets hit so hard, please let me know, because I can't figure it out. 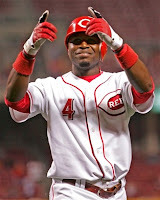 He seems to be just what the Reds need, as he limits his walks, racks up the strikeouts, and gets a ton of groundballs. That said, he has given up a ton of runs this year and has been very susceptible to the long ball. Hopefully, he can get things straightened out for next year, because he could be a pivotal pitcher in the Reds bullpen in 2008. I still think Kirk Saarloos was a nice addition early this year, as he was a nice risk/reward acquisition. For his career, he has a 2.16 GB/FB ratio, which is what the Reds need in Great American Ballpark. Unfortunately, he walks too many and strikeouts too few to be consistently successful. To say that he hasn't worked out would be an understatement, but it was certainly worth a roll of the dice, as it cost nothing to find out what he would bring to the table. 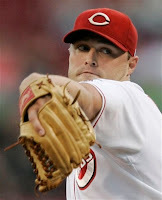 Brad Salmon was ranked as the 25th best prospect in the Reds system in 2007. He has 8 years of minor league experience under his belt and is 27 years old. Salmon features a 93-95 mph sinking fastball and a hard, inconsistent slider. Reports on Salmon were that he does a nice job keeping the ball down in the zone and gets a lot of ground balls. During his time in the majors, he has a 1.09 GB/FB ratio, so he isn't getting a lot of ground balls as of yet. He's intriguing, as his time in the minors likely gave him mental toughness that will serve him well in the majors. If he continues to build on his fairly impressive 2007 campaign, then he may well have a future in the Reds bullpen. Joey Votto is the Reds 3rd ranked prospect and is coming off a very fine season at Louisville. Votto posted a line of .294/.381/.478/.859. Votto hit 22 homeruns, but only posted a .478 slugging average. That said, his on base skills are very strong and he should be a solid MLB player. The Reds need to get him some regular playing time in September, which is made more difficult by the Reds inability to trade Hatteberg, Dunn, or Griffey at the trade deadline. Still, he needs some MLB At Bats. The Reds acquired Buck Coats from the Cubs for a player to be named later. Coats hit .308/.366/.439/.806 in AAA this year. He doesn't seem to be anything more than a 4th or 5th outfielder, but given Krivsky's track record with undervalued talent, it'll be interesting to see how well he fills that role. Ryan Hanigan is a 27 year old organizational player who will act as the Reds 3rd catcher for the remainder of the season. He isn't considered a legitimate prospect, but it's nice to see him get a cup of coffee at the big league level. At least he'll have a story for the grandkids. Sadly, anxious Reds fans will have to wait until next year to get a glimpse of uber-prospect Jay Bruce. Bruce won Baseball America's Minor League Player of the year for his performance in 2007, which saw him post a line of .319/.375/.587/.962 across three different levels. Unfortunately, a crowded Cincinnati outfield leaves him with no place to play, so he doesn't get the September call up. It seems like the more light that statistical analysis sheds on the game of baseball, the more the importance of defense is revealed. Over the years, it has always been difficult to determine where pitching ends and defense begins. The two are so intertwined, that it has been difficult to separate them out to determine the true abilities and deficiencies of a team. However, modern analysis is beginning to effectively separate out the difference. Two team defensive statistics, Defensive Efficiency Ratio (DER) and Team +/-, have been developed that effectively quantify the defensive abilities of a team. "Defense Efficiency Ratio: The percent of times a batted ball is turned into an out by the teams’ fielders, not including home runs. The exact formula used by the Hardball Times is (BFP-H-K-BB-HBP-Errors)/(BFP-HR-K-BB-HBP). This is similar to BABIP, but from the defensive team's perspective. Please note that errors include only errors on batted balls." "Our team "plus/minus" stat is an improvement over DER, because it corrects for the type of batted ball allowed. In other words, it adjusts the thinking behind DER by the number of infield flies, line drives and all other types of batted balls allowed by each pitching staff. I explained the system in more detail when we rolled it out last year. In addition to adjusting DER, the "plus/minus" stat expresses each team's fielding performance as the number of plays above and below the expected number of plays an average team would turn. This is a more concrete and useful way of thinking about fielding." This is how the NL teams rank defensively from best to worst. So, the Cubs are the NL's best defensive team and the Marlins are the NL's worst defensive team. Something interesting comes to light if you look at the Winning percentages of these teams broken down into quartiles. 1st quartile: Cubs, Mets, Padres, and Nationals. 2nd quartile: Diamondbacks, Giants, Braves, and Rockies. 3rd quartile: Cardinals, Dodgers, Phillies, and Astros. 4th quartile: Reds, Brewers, Pirates, and Marlins. Here's how these quartiles stack up when broken out by 2007 winning percentage. To me, it is becoming clearer that the Reds cannot win as currently configured. A team that is built around Adam Dunn, Ken Griffey Jr., and Edwin Encarnacion is built on unstable foundation. The offensive prowess of those three is outweighed by their defensive deficiencies. Both Dunn and Griffey are leftfielders, so you can't have both of them in the lineup at the same time. At least one of them has to go. Edwin has taken a step forward defensively, but he's still league average at best. The problem seems to be that the Reds are going to continue attempting to build their team around poor defensive players. That kind of strategy just doesn't work, as generally speaking: the better the team defense, the better the W/L record. The general thought is that the Reds need better pitching and I agree, but how much better would the pitching looking with a top notch defensive playing behind it? 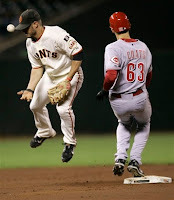 If the Reds want to have a better season in 2008, then the first priority has to be improving the defense. That would have the biggest impact of anything that could be done for 2008. Unfortunately, the Reds continue to lock themselves into a roster of defensively deficient ballplayers, which offsets much of the advantages of a good offense and a strong pitching staff. Sadly, it's difficult to envision the Reds as a winning organization until they improve the defense. While the Reds overall are playing much better baseball over the past couple of months, they are simultaneously carrying out an equally important goal. They are evaluating talent to see what they have and what they lack. This is especially true with the pitching staff, as the everyday lineup is pretty well set. However, it is nice to see Jorge Cantu performing well and David Ross above the Mendoza line. The real revelations have emerged in the bullpen, where Jared Burton, Bill Bray, and Jon Coutlangus have all established themselves as reliable relievers who can really help the bullpen in 2008. These three young pitchers have stepped up to take the load off the back of David Weathers, who was trying to do it all in the first half. All three have robust strikeout rates and strong grounball tendencies, which is what you need to survive in Great American Ballpark. While the walk rates need to come down, those four would make a nice foundation for a 2008 bullpen, which is music to the ear of Reds fans everywhere. Unfortunately, the extended opportunity has also resulted in several players being dropped from consideration. At this point, it seems very clear that Phil Dumatrait is not a Major League pitcher. He's been given several starts, but cannot even get his ERA into single digits, so it's likely time to move on. Dumatrait was a long shot to contribute, but earned a look with his solid performance at AAA Louisville. In addition, Stanford product Mike Gosling does not seem capable of holding down a job in a major league bullpen. He managed to post some decent numbers early, but the larger sample size has revealed him to be a poor bet. Given how he's performed this year, it's hard to envision the Reds bringing Mike Stanton back in 2008, despite the fact that he's under contract. Unless Stanton improves in the early stages of 2008, he will be gone. He could be gone sooner, if the Reds can find a taker for his salary. There are still a few players on the bubble, who may make or break over the final month of the season. Gary Majewski, Marcus McBeth, and Brad Salmon are all still on the fence. Majewski has been better of late, but still not all that good. Patience in the organization is likely to be running out on Gary and he needs to step it up very soon. As for McBeth and Salmon, they both need to demonstrate that they can consistently contribute in 2008. The Reds bullpen single handedly brought down the Reds season in 2007, so there is no way that the front office will allow it to happen again next year. Weathers, Burton, Bray, and Coutlangus seem like locks for the 2008 bullpen, but it remains to be seen who will claim the last three relief spots. The bottom line is that, as of now, the Reds have four quality relievers in the bullpen, which is three more than they had in the first half of the season. The Gulf Coast League wrapped up its regular season play on Monday, August 28th. Unfortunately, the GCL Reds not only missed out on the postseason, but also finished dead last in the Southern Division. The end of the season brought about an end to top prospect Devin Mesoraco's first taste of professional baseball. Mesoraco didn't exactly set the world on fire, finishing up at .219/.310/.270/.580, but given that he's straight out of high school and facing professional pitching for the first time it isn't surprising. Given an offseason to re-energize and better prepare for his first full season, the results in 2008 should be much better. The Official Minor League Baseball website put together a draft profile about Mesoraco, which includes a scouting report on his skill set and a scouting video. Mesoraco profiles well across the board and the video captures his strong arm and impressive athleticism. The Sarasota Herald Tribune put together an interview with Devin Mesoraco and a slide show on his first season that is worth a look. I'll be excited to see how Mesoraco develops next year, as his impressive athleticism makes me hopeful that he can become the Cincinnati version of Dodger catcher Russell Martin.